Between going around the sheep morning and night we have been getting the hoggs ready to go to the moor. The hoggs came back from winter grazing away in January, which is earlier than it used to be as it was the end of March. Next year we don’t know what to do with them as Natural England is paying the farmer not to grow stubble turnips after his whole crop and to leave it fallow instead. The farmer gets paid more than double from Natural England than what we paid him to graze the stubble turnips. The hoggs have to be horn burned so that people can tell whose sheep they are if they stray. Horn burning involves a piece of marked metal (iron) heated up and then pressed onto the horn, as a permanent form of identification. Our horn burn is E.G. – these are my Great Grandad’s initials. People horn burn because even though the sheep have to be double-tagged (one electronic tag and a manual tag) they can still fall out and you can normally see a horn burn from a distance without having to get hold of the sheep. When the hoggs were born last year they were also ear marked as it is only that which is permanent. We have two distinct ear marks, one ear has two snips out of the top of the ear and the other is the end of the ear off and a snip up on the bottom of just one ear. 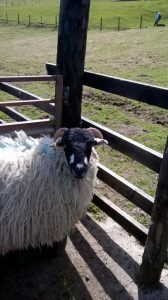 Also before the hoggs go to the moor they are jabbed with an abortion vaccine- Cvac Chlamydia. This is to prevent them aborting their lamb/s the following year. If they abort it is normally two weeks before lambing and is often over 20% of the flock. This abortion is called Enzotic Abortion. We are lucky that we only have to vaccinate against this one as there are another 2 or 3 different types of abortion that are more expensive to vaccinate against. The hoggs are marked with our mark before they go, some have blue on their shoulder and the others have 2 blue dots on their ribs. The hoggs went to the moor last week and look to be doing well, a few more less mouths to feed at home. In addition the end of lambing is in sight, thankfully there are less problems now which makes life a lot easier. We have just past the fortnight end which is when most of the sheep lamb and then should finish in the next week. Since it has come cooler there has been less pinned tails. This is when the lamb’s tail gets stuck down which means they are getting lots of milk from their mothers. Normally tups are the worst, but some gimmers do get pinned tails now and again.